If you’re wondering where March went, you’re not alone. As it turned out, weather-wise, this March has veered from one extreme to another. I have enjoyed the days of sunshine and short sleeves more than the days with snow or rain. Of course, even the rain has been welcome since it helped many of our early spring flowers unfurl their petals once the sun returned. Birding has been productive this past month, and I have been pleased to see some of our usual summer birds returning for the year. My most exciting observation this past month, however, would have to be the Ross’s Goose found at the Great Lakes pond on the campus of Northeast State Community College in Elizabethton. 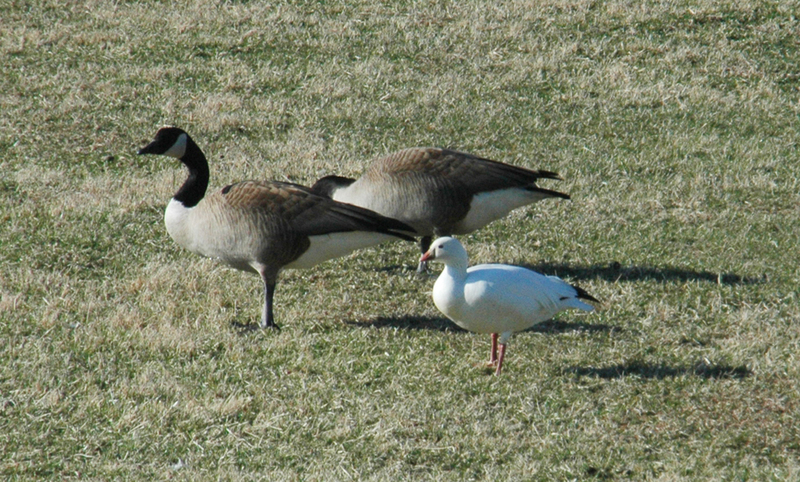 A Ross’s Goose, foreground, is shown with two Canada Geese. The photo makes plain the small size of the Ross’s Goose. I saw the goose at the pond on March 11, but some fellow birders alerted me to the bird’s presence. 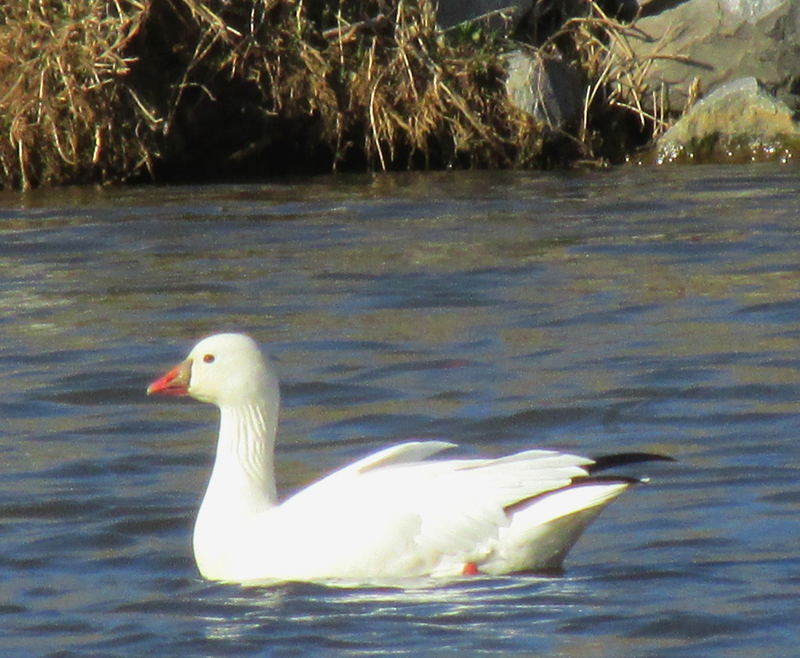 The goose also lingered at the pond and around the nearby Watauga River for several days after I saw it. The common name of this goose honors Bernard R. Ross, who was associated with the Hudson’s Bay Company in Canada’s Northwest Territories. Here’s a quick history lesson. Hudson’s Bay Company is the oldest commercial corporation in North America. The company has been in continuous operation for more than 340 years, which ranks it as one of the oldest in the world. The company began as a fur-trading enterprise thanks to an English royal charter in back in 1670 during the reign of King Charles II. These days, Hudson’s Bay Company owns and operates retail stores throughout Canada and the United States. In addition to his trade in furs, Ross collected specimens for the Smithsonian Institution in Washington, D.C. Ross is responsible for giving the goose that now bears his name one of its early common names – the Horned Wavy Goose of Hearne. I wonder why that never caught on? He repeatedly insisted that this small goose was a species distinct from the related and larger Lesser Snow Goose and Greater Snow Goose. His vouching for this small white goose eventually convinced other experts that this bird was indeed its own species. Ross was born in Ireland in 1827. He died in Toronto, Ontario, in 1874. He was described by other prominent early naturalists as “enthusiastic” and “a careful observer” in the employ of Hudson’s Bay Company. When John Cassin gave the Ross’s Goose its first scientific name of Anser rossii in 1861, he paid tribute to the Hudson’s Bay Company’s Ross. 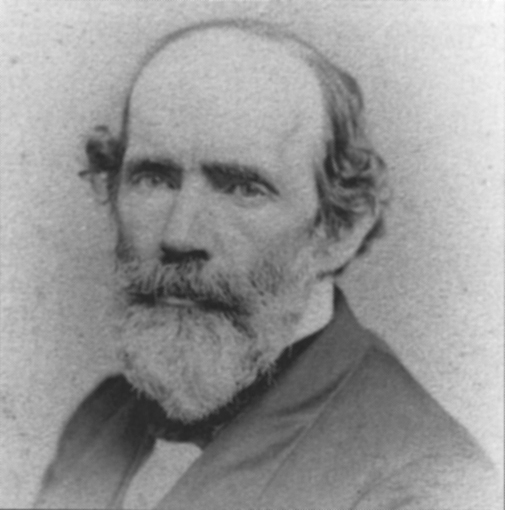 Ornithologist John Cassin named the Ross’s Goose in 1861 in honor of Bernard Ross, who helped convince scientists that this small goose of the Arctic tundra was a true species. Cassin was a famous American ornithologist and curator at the Philadelphia Academy of Natural Sciences. I suppose the fact he died of poisoning due to his handling of bird skins preserved with arsenic must be considered rather gruesomely ironic. Despite a death that resulted indirectly from his enthusiasm for birds, Cassin has also been immortalized by having several species named in his honor. Cassin’s Finch, Cassin’s Kingbird, Cassin’s Auklet, Cassin’s Vireo and Cassin’s Sparrow all bear his name. The Ross’s Goose has a “cuteness” factor working in its favor. For a goose, it is rather small. It could best be described as a Snow Goose in miniature. In fact, it isn’t much larger than such ducks as Mallards and is considered the smallest of North America’s geese. The Ross’s Goose has also acquired some other common names, including “Galoot” and “Scabby-nosed Wavey.” This latter name was inspired by the bird’s bill, which is covered with rough bumps around the base. I have to admit that “Scabby-nosed Wavey” is a name likely to stick in the memory. Today, the Ross’s Goose’s scientific name is Chen rossii. This bird’s other claim to fame is that it’s nesting territory wasn’t discovered by scientists until 1938, more than 70 years after this goose was first described by men such as Ross and Cassin. It turns out that the Ross’s Goose nests in the Arctic on tundra, marshes and ponds. Today, this breeding range is protected as the Queen Maud Gulf Migratory Bird Sanctuary and is the summer home to most of the world population of this small goose. During the winter months, these geese favor shallow lakes, fresh-water marshes, flooded fields and other agricultural lands. According to the Ducks Unlimited website, the California Central Valley is currently the main wintering area for the Ross’s Goose. Increasing numbers of these geese, however, now winter in Arkansas, Louisiana, New Mexico, Texas and the north-central highlands of Mexico. The visiting Ross’s Goose takes a swim on the large pond at Northeast State Community College in Elizabethton. Winter and migratory visits by these geese to Northeast Tennessee are still rather rare. According to the book “Birds of Northeast Tennessee” by Rick Knight, the Ross’s Goose made its first recorded appearance in the region in 1998. Over the next decade, only 11 observations were documented for this goose. Since 2008, a few more sightings have been added to this records, including the recent one at the Great Lakes pond. This body of water has become a magnet for other unusual waterfowl, including Greater White-fronted Goose, Snow Goose, Red-necked Grebe and Canvasback. I finally saw some Purple Finches at my feeders at home on Simerly Creek Road in Hampton on March 29. Photo by U.S. 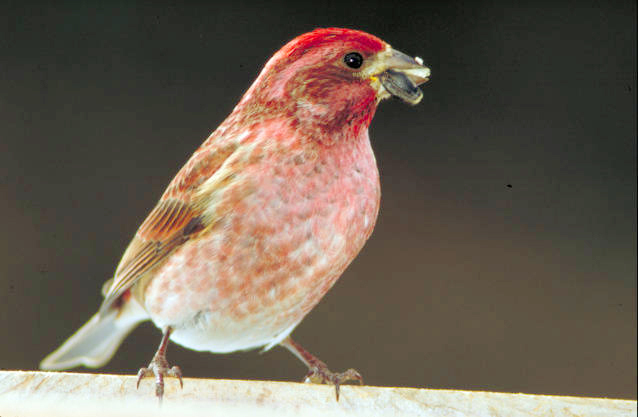 Fish and Wildlife Service/Thomas G. Barnes A male Purple Finch, if observed carefully, can be reliably distinguished from the familiar House Finch. Steve Ward from Atlanta, Ga., posted a question to my Facebook page after I posted some photographs of male Purple Finches. Steve wanted to know how to best distinguish Purple Finches from House Finches. I did offer Steve a few tips in a reply I posted on Facebook. I’ve never really had trouble identifying Purple Finches from House Finches. This is one of those easily confused bird combinations that I don’t get confused about. There are some clues to look for if you get a visit by either of these species at your feeders. Purple Finches, in my opinion, have more distinctive facial patterns. The males also seem more infused with the wine-red or raspberry-purple coloration that give the species its common name. I think the Purple Finch also has a slightly heavier bill. It’s probably easier to tell them apart if you happen to have them visiting your feeders at the same time. I think female Purple Finches are even easier to contrast from female House Finches. Most female Houses are extremely drab and lack the distinct facial pattern that is so evident in a female Purple. By the way, I love that writing this blog allows me to interact with people here in Northeast Tennessee, as well as in such locations as in Georgia, South Carolina and even in other countries. I love hearing from readers. Just post comments on my blog at ourfinefeatheredfriends.wordpress.com. You can also reach me on Facebook or send email to ahoodedwarbler@aol.com. Please share the link to my blog with others who might be interested in the topic of birds, birding or nature in Northeast Tennessee. This entry was posted in Birding, Birds and tagged Bernard Ross, Birding, birds, Chen rossii, Elizabethton Star, Erwin Record, House Finch, Hudson's Bay Company, John Cassin, nature, Purple Finch, Ross's Goose on March 30, 2014 by Bryan Stevens.